George Ives, the last veteran. 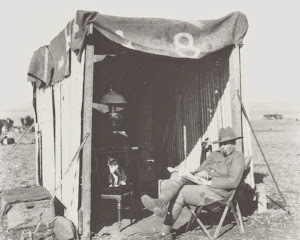 Trooper 21198 George Ives, 1st (Wiltshire) Company, 1st Battalion Imperial Yeomanry is believed to be the last surviving veteran of the Second Anglo-Boer War. Born in Brighton on November 17, 1881 he died on April 12, 1993 aged 111. Although one obituary states he was born in France but his birth was registered in England to avoid being called for French military service. He enlisted for the Imperial Yeomanry at Cheltenham, Gloucestershire on January 30, 1901, aged 20 years old, a grocer by trade. He served in South Africa from March 1901 to August 1902, he was grazed by a bullet across his cheek which left a scar. This wound was so slight it did not merit a mention in the official casualty rolls. He was discharged in England in September 1902 after serving for one year and 216 days. For his service he was awarded the Queen's South Africa medal with the clasps, Cape Colony, Orange Free State, Transvaal, South Africa 1901, South Africa 1902. After the war he decided to settle abroad and a toss of the coin sent him to Canada in 1903 where he set up a famr with his father. He married in 1910, retired from farming in 1941 aged 60 but continued to work in various jobs until a final retirement aged 75. In 1992 he was bought over to attend the Remembrance Day parade in London. In the attached PDF are two obituaries and a short article on his visit to the UK in 1992.
a farm in Natal Colony (Estcourt district; KwaZulu-Natal) on which the village of Chieveley is situated. Variant: Bloukrans (Afrikaans spelling as used on the 1: 250,000 map). The armoured train derailment and the capture of 80 prisoners by the Wakkerstroom and Heidelberg commandos, including Mr. W.L.S. Churchill, on 15 November 1899 took place on the farm Blaauwkrantz. The train was manned by A company 2nd bn Royal Dublin Fusiliers, C company Durban Light Infantry and sailors from HMS Tartar. The area had particular significance for the Boers since the Blaauwkrantz Monument commemorating the voortrekkers killed during the Weenen massacres had been dedicated here only on 16 December 1895. The incident is referred to by British historians as taking place at Chieveley and Estcourt. The composition of the force on the train is generally stated to be a company (or half company) from the 2nd battalion Royal Dublin Fusiliers (A company) and the Durban Light Infantry (C company) and sailors from HMS Tartar manning a 7pdr gun. Although the chief eyewitness, war correspondent Winston Churchill states the sailors were from HMS Terrible (My Early Life, 1930). The train was run by civilian crew and a number of gangers and platelayers accompanied the train. At the time British newspapers reported the force to number between 180-190 men (The Times 18-11-1899). The train was ambushed and partially derailed. The Boers shelled the train and poured in a heavy rifle fire. A stout defense was made but the 7pdr was soon disabled by Boer artillery. The engine and tender remainded on the rails and smashed through boulders placed across the line. The engine and tender returned to Estcourt with a number of men and some wounded. The Boers claimed British casulties were four killed, 14 wounded and 56 POWs. The wounded were retained as POWs, an ambulance train sent out by the British to recover the wounded was not allowed to recover any men. Some of the wounded had returned on the engine and tender, and some made their way back on foot. Interestingly only five men are listed as wounded and POW, there must be some imprecise reporting of casualties amongst the wounded and POW group, not all the wounded would have got away. Having advanced the known casualties to 96, the question researchers and medal collectors want to know, "who else was there?". The sources I used to get the extra casualties have revealed another thirteen names*. Disappointingly, Romer's history for the Royal Dublin Fusiliers only mentions Pte 5256 M Kavanagh who was awarded the DCM. There is an error somewhere, either the medal roll or the printed casualty list. * Napier's name comes from a letter he wrote printed in the The Southern Reporter ,21-12-1899. I am indebted to Berenice for this information.